HHS has remarkably clear and easy to navigate budget pages. For example, the FY2017 Budget in Brief for Medicare is here. Note that while 2017 is imminent, projections for 2017 budget were made early in CY2016. Medicare's total benefits spending in FY2017 is projected at $709B, with about $100B covered by direct premiums. Administration for Medicare is budgeted at $9B, or just over 1%. Part A will be $202B, and Part B will be not much less, at $193B. Enrollment grows slowly, at about +1.7% per year, with 58 million total beneficiaries. Of these, 49 million are age 65 and over, 9 million are disabled. 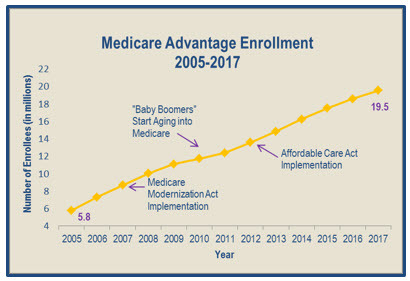 However, note that of these 58 million beneficiaries, 20 million will be in Medicare Advantage aka Medicare Part C. Part C has doubled in the last 10 years, from 10 to 20 million. Part D comes in at about $110B, with average monthly premium of $41 (and deductible of $360). 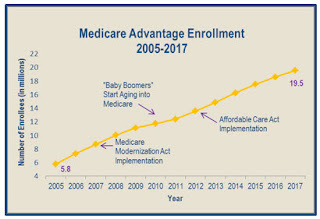 Medicare projected that from 2021-2031, it would save $10B from new bundled post acute care, not much since Medicare payments would be at least some $7 or $10 trillion during those ten years (my own conservative guess). Similar, CMS projected that more use of telehealth in Medicare Advantage could save $160M over ten years, pretty tiny to the many trillions CMS spends every 10 years. For contrast, it looks like some LCDs on CYP testing carved $100M-plus out of the CMS molecular pathology budget between CY2014 and CY2015 - in just one year (here). From the HHS budget link provided, you can easily navigate back up into costs for other divisions of CMS or costs for other parts of HHS like FDA and NIH.